If you want to encourage the growth of healthy plants in your tropical freshwater aquarium, there's nothing like giving them a nutritious supply of peat to take root in. But peat can alter the chemistry of your tank, cloud the water and cause problems for your fish. Is it still worth using? If so, how can you get the balance right? 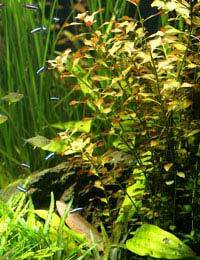 Many aquarists are unhappy about using peat because it can discolour the water. There are two ways to reduce the impact of this. One is to set up your tank with a layer of peat at the bottom covered by sand and then gravel. This allows the peat to do its job chemically without being free to float around, and it's easy to root plants in it. However, each time you put in a new plant you'll be releasing peat into the main part of the tank. Layers like this can also be disrupted by burrowing fish. It's impossible to refresh a peat layer like this once your tank is up and running. An alternative technique is to wrap up a small handful of peat in a cotton or nylon bag (part of an old pair of tights will do if you thoroughly rinse it first), insert the roots of your plant into this bag and tie it securely around the stem. You can then bury the bag in your ordinary aquarium substrate with the plant protruding. This gives the plant limited space to expand its roots, but if necessary you can increase the size of the bag when you change the peat, which you should do monthly to maximise its growth-enhancing effects. Using a bag like this has the added advantage of protecting plant roots from fish that have learned to dig them up and chew them. The first thing you should be aware of when choosing peat for your aquarium is only to purchase it from fish shops. Peat which you've bought in a garden centre or dug out of the ground may contain chemicals which are dangerous to your fish. Tank-friendly peat contains humic, fulvic and tannic acids, so it will lower the pH of your aquarium. For this reason you should add it only in small amounts at a time, as drastic changes can upset your fish, and it's quite unsuitable if you're keeping fish that need alkaline water. You should also be aware that this effect will decrease as the peat gets old. Test your water frequently to make sure it remains suitable for your fish. Peat is good for plants because it contains organic compounds and carbon dioxide which stimulate their growth and improve their health. It also contains nitrates which provide them with food. It has a further advantage in that it removes some heavy metals from the water and binds them up harmlessly, though this means that it it incompatible with some kinds of fish medication, neutralising the active compounds. Peat can also have a stimulating effect on fish. Because it releases hormones into the water, it can sometimes encourage fish to breed. It is particularly recommended for fish which naturally live in acidic water, such as some species of discus. Planting with peat can be difficult to get right and is not suitable for the beginner aquarist, but once you know what you're doing there's no reason why you shouldn't be able to make it work. As so often, the key is to go slowly and pay careful attention. Well managed peat can lead to thriving plants and happy fish.